The upgraded air pollution control systems include a vertical, rapid-quench chamber, multi-rod condenser/absorber, and two wet electrostatic precipitators in series. The former systems consisted of a waste heat boiler, horizontal quench chamber, packed bed scrubber (liquid waste incinerator only), and high-energy venturi scrubber. The upgrade of the liquid waste incinerator has been recently completed. The unit has undergone startup and emissions testing. The upgraded facility has successfully demonstrated emissions performance in compliance with the MACT standards for particulate matter, hydrogen chloride/chlorine, MACT metals, and dioxins/furans during a series of preliminary performance tests. This paper presents a summary of emission results for these tests. Introduction: Eastman Chemical Company operates three hazardous waste incinerators at its facility in Kingsport, Tennessee, one liquid waste incinerator and two rotary kiln incinerators. These incinerators are currently operating under RCRA permits and are subject to the HWC MACT rule. The air pollution control systems (APCS) for these incinerators are being upgraded to reliably meet the MACT emissions standards for existing hazardous waste incinerators. The upgraded air pollution control systems include a vertical, rapid-quench chamber, multi-rod condenser / absorber, and two wet electrostatic precipitators (WESPs) in series. Eastman obtained agency approval for a Class 11 RCRA permit modification and proceeded with construction of the liquid waste incinerator upgrade in September 1999. This was the first of the three incinerators to be upgraded. The liquid waste incinerator was returned to RCRA service in January of 2000. A series of stack emissions tests were performed in April through June 2000. During these tests, emissions data were collected to determine system performance with respect to HWC MACT emissions standards. The final test, conducted on June 13, 2000, simulated the likely test conditions for a MACT Comprehensive Performance Test (CPT). The results of the tests demonstrate emissions performance in compliance with the MACT standards for particulate matter, hydrogen chloride/chlorine, MACT metals, and dioxins/furans. This paper presents a discussion of the upgrade, the design of the emission tests, and the results of the emissions testing. HWC MACT Emissions Requirements: The National Emissions Standards for Hazardous Air Pollutants (NESHAPS) for Hazardous Waste Combustors (HWCs) was promulgated as a final rule (40 CFR Part 60, Subpart EEE) in the Federal Register on September 30, 1999, under joint authority of the Clean Air Act (CAA) and Resource Conservation and Recovery Act (RCRA). The rule establishes technology-based emissions standards for incinerators, cement kilns, and lightweight aggregate kilns that burn hazardous wastes for treatment or as supplemental fuel. Since the emissions standards reflect the performance of Maximum Achievable Control Technologies (MACT), the rule is commonly called the HWC MACT rule. Emissions standards for new and existing incinerators under the HWC MACT rule are presented in Table I. Facility Description: Waste Feed And Combustion Systems: Eastman treats a variety of hazardous and non-hazardous wastes in its incinerators. Liquid wastes are burned in both the liquid waste incinerator and the rotary kilns, while sludges and containerized solid wastes are burned in the rotary kilns. Until recently, general plant trash was also burned in the rotary kilns. The liquid waste incinerator is designed for a thermal capacity of 14,600 kW (50 MMBtu/hr), and is commonly referred to as the liquid chemical destructor (LCD). 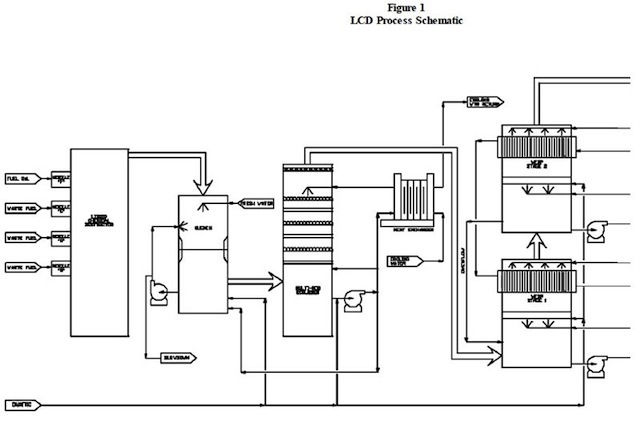 A process schematic of the liquid waste incinerator is provided as Fig. 1. The LCD consists of a rectangular, refractory-lined, horizontally-fired combustion chamber. The LCD operates at temperatures ranging from 870 � 1150 ? C (1600 � 2100? F). Waste liquids are received for incineration in either tanker trailers or dumpsters (small, portable tanks). These liquids can be fed directly from the trailers or dumpsters or can be transferred to waste feed tanks for storage. The waste liquids are routed through a switching station, which allows feeding of any of the waste burners or nozzles from any feed location. The combustion equipment includes two air-atomized burners and two steam-atomized injection lances located at one end of the LCD. One of the burners is dedicated to fuel oil for use during startup. Combustion gas is discharged at the opposite end of the chamber through a refractory-lined duct to the entrance to the quench. The incinerators are equipped with a distributed control system (DCS) that is tied to field instruments and controls. The DCS provides for monitoring, control, and recording of process parameters. An automatic waste feed cutoff (AWFCO) system is integral to the DCS and shuts off waste feeds should a process parameter approach or exceed its permitted value. Air Pollution Control System: The original APCS for each incinerator consisted of a waste heat boiler, horizontal quench chamber, packed bed scrubber (LCD only), and high-energy venturi scrubber. Each incinerator had its own induced draft fan, and the rotary kilns shared an exhaust stack. 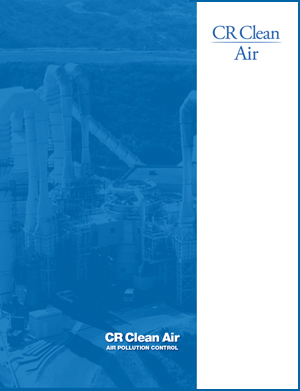 The air pollution control systems for the MACT upgrade are supplied by Clean Air Technologies. Each upgraded air pollution control system includes a vertical, rapid-quench chamber, multi-rod condenser/absorber, and two wet electrostatic precipitators (WESPs) in series. The rotary kiln APCS upgrades also include the addition of a secondary combustion chamber (SCC) to each kiln for improved control of organic emissions and CO. Each upgraded rotary kiln/SCC system will be rated for 23,400 kW (80 MMBtu/hr). The upgraded APCS offers the advantages of rapid gas quenching to minimize potential formation of dioxins/furans, increased mass transfer for control of acid gas, and improved removal of fine particulate and metals. The APCS upgrade of the liquid waste incinerator was completed in early 2000, while the first of the two rotary kilns is currently being upgraded. Hot combustion gas enters the quench chamber where it is cooled by water sprays to adiabatic saturation temperature. The saturated gas enters the multi-rod scrubber and flows upward through a series of six decks of closely spaced rods. Recirculation water flows downward through the chamber and creates a liquid/gas contacting (froth) layer at each of the rod decks. As the gas flows upward through this foam layer, acids and large particles are removed by absorption and inertial impaction. The recirculation water is cooled in a plate and frame heat exchanger. The gas is subcooled through direct contact with the recirculation water, causing condensation of excess water vapor. The subcooling and condensation decrease the volumetric flowrate of gas and create flux force/condensation scrubbing effects. These effects result in particle growth, making particles easier to remove in the downstream WESPs. Subcooled, saturated gas exits the multi-rod scrubber and enters the bottom of the first of two WESPs in series. The gas flows upward through a distribution bed consisting of a 10 cm (4-inch) layer of marbles. Recirculation water is sprayed upward onto the marble bed, creating a froth zone immediately above the bed. The marble bed provides even distribution of the gas before it enters the electrode tubes. The intimate gas-liquid contact in the marble bed also provides additional surface area for acid gas absorption and particle removal via inertial impaction. Gas exits the marble bed and flows upward through 280 electrode tubes. A charging electrode is suspended in the center of each tube. The charging electrode ionizes the gas stream, which in turn charges the suspended particles. The charged particles are attracted to the wall of the tube that acts as a collecting electrode. The tubes are surrounded by cooling liquid, providing non-contact cooling of the gas stream. The gas is slightly subcooled causing condensation that collects on the tube walls, flushing the captured particles from the system as it flows down the tube walls. The gas exits the first WESP and enters an identical WESP, which provides an additional level of particulate removal. The cleaned, cooled gas exits the second WESP and is drawn through a variable speed ID fan which exhausts to a stack. The concentration of CO and O2 in the stack gas are continuously monitored and recorded by a continuous emissions monitoring system (CEMS). Waste feeds are cut off if the CO level exceeds its permitted value. 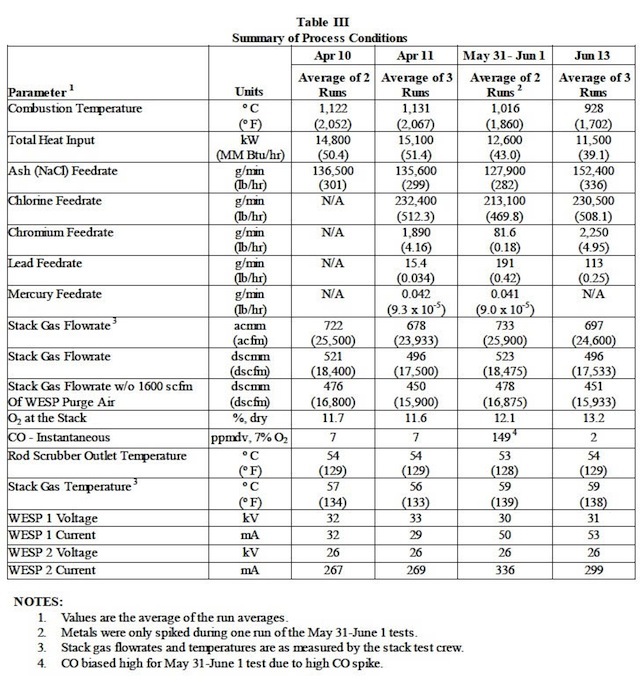 Performance of the combustion system for POHC DRE and emissions of CO and THC were not included in the performance test, as no modifications were made to the combustion system. Emissions of CO were monitored using the installed CEMS during the tests. An overview of the test protocols is provided in Table II. The tests were conducted using surrogate feeds and spikes for ash, chlorine, and metals. Surrogates and spikes were used to maximize all worst-case feed parameters simultaneously. Sodium chloride was selected as the primary ash source since most of the ash fed to the liquid waste incinerator is in the form of sodium chloride. Sodium chloride also represents a worst-case for particulate removal in the air pollution control system. This is due to the fact that the sodium chloride will partially vaporize in the combustion chamber and recondense in the quench to form extremely fine submicron particles. A second reason for feed salt during the tests was that it was noted during startup of the system that the presence of salt in the waste feeds caused severe current suppression in the WESPs, especially in the first WESP. Current suppression can reduce the effective performance of the WESPs in relation to particulate and metals removal, as discussed below. Chromium and lead were selected to be representative of the LVM and SVM categories, respectively. These metals are the most prevalent MACT metals in Eastman’s wastes. The acetate salts are a common form of the metals found in Eastman’s wastes and the acetate fraction will combust in the combustion chamber. Combustion of the acetate fraction will result in an extremely fine metal particle. Perchloroethylene and dichlorobenzene were selected as a source of chlorine since they are likely POHCs for the CPT test. Effect of Current Suppression on WESP Performance: The presence of any salt in the feed streams caused severe current suppression, even at very low feedrates of salt. The severity of the current suppression did increase with an increase in the salt feedrate, but the increase in severity of current suppression was not dramatic. Severe current suppression occurred virtually as an “on/off” effect whenever salt was fed. Severe current suppression results in an operating current that is 20 to 30 times lower than the maximum achievable current. This is believed to be due to the extremely fine particle size distribution (< 1 μm) resulting from the vaporization of salt in the combustion chamber and subsequent condensation in the quench. A high concentration of fine, submicron particles in the precipitator electrode tubes will result in a very intense space-charge cloud, which impedes the flow of electrons from the discharge electrode and reduces the performance of the WESP. Current suppression is more severe at higher gas flowrates, since the residence time of the particles in the WESPs is reduced. The severity is also increased by the fact that submicron particles are not efficiently removed in the quench and rod scrubber, causing a higher concentration of particles at the inlet to the WESPs than would be observed with a larger particle size distribution. Although severe current suppression occurs whenever salt is fed to the incinerator, the results of the stack testing indicate that particulate and metals removal efficiencies are still high enough to comfortably achieve the MACT emissions concentration limits. 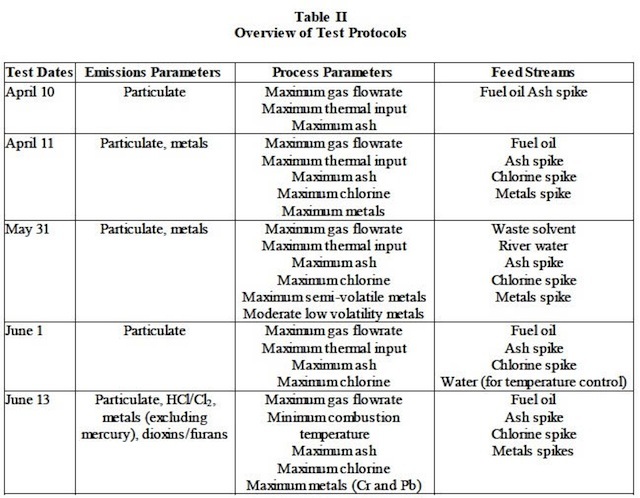 Results Of Emissions Testing: Table III presents the process conditions during the performance tests. Emissions results are presented in Table IV. 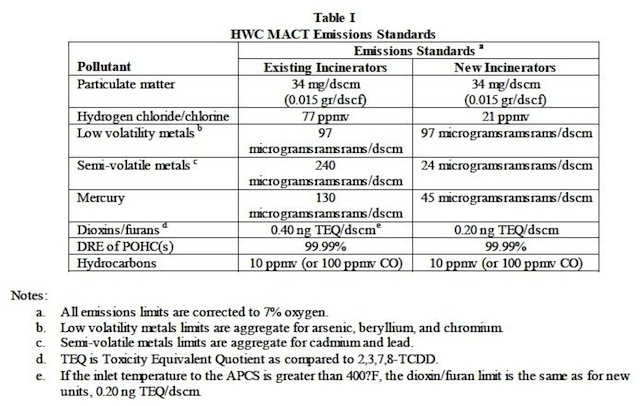 The HWC MACT emissions limits are also listed in Table IV for comparison. The results of the tests demonstrate that emissions from the upgraded APCS are below the MACT requirements under worst-case operating conditions. It should be noted that LVM and SVM removal efficiencies were only determined for chromium and lead, as representative of their respective LVM and SVM categories. Conclusion: All goals of the performance tests were met. The results of the tests indicate that the upgraded APCS on the liquid waste incinerator can successfully meet the emissions requirements of the HWC MACT, even under worst-case operating conditions and severe current suppression in the WESPs. As a result of the June 13 test, Eastman received a permit modification that allowed for operation under lower WESP specific power. Specifically the permit was modified to revise this requirement from 31.4 watts/m3 (890 watts/1000 acfm) HRA to 11.0 watts/m3 (312 watts/1000 acfm) HRA. This was necessary to allow operation of the unit at full thermal capacity under conditions of severe current suppression. The liquid waste incinerator is fully operational and has received full authorization to burn hazardous waste under the revised permit conditions.